Get ready for Observer Tree’s Anniversary cyber celebration set to hit the globe next Friday! I’ll join you via video link up from my tree top home. There’ll be two events in different time zones – so pick the one that suits you. December 14th – 6:30pm Aust. Eastern Daylight Savings Time. December 13th – 6pm CTZ American Time. How do you get on board? It’s easy!! 1. Get together with your friends, get online and watch the livestream on www.observertree.org. Send in comments and questions online. 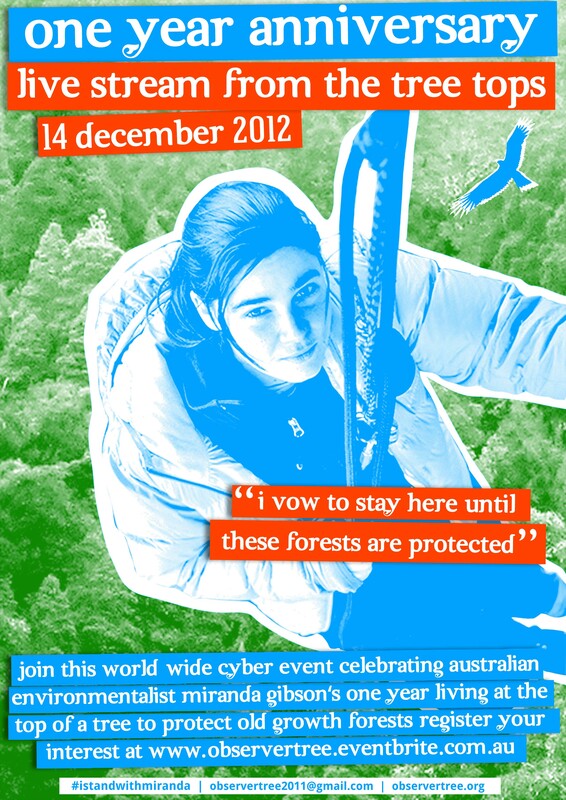 Confirmed community events in: Brisbane, Katoomba, Melbourne, Alice Springs, Hobart, Launceston. Plus – more info to come on these locations: Seattle, Bristol, Lismore, Perth, Adelaide, Broome, Tokyo, Nimbin. Posted on December 7, 2012, in Events. Bookmark the permalink. Leave a comment.